Natasha Glasgow and her son, Alfredo, in their foreclosed building in Far Rockaway, Queens. 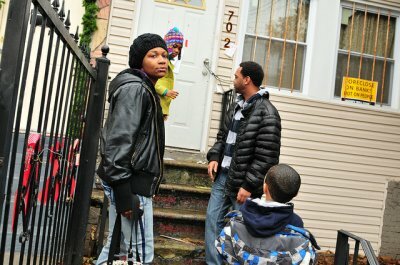 On Dec. 6, Occupy Our Homes illegally entered and cleaned a vacant foreclosure in East New York, where Natasha plans to move her family later this week. Photo courtesy of Sam Lewis. Natasha Glasgow and her family, including a 5-year-old son and 9-year-old autistic daughter, have been homeless since 2008, when their apartment building was foreclosed on. 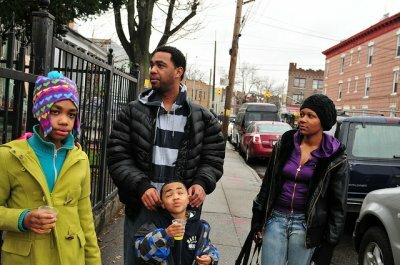 With no heat or hot water, the family was forced back into the city’s shelter system. This week, with the assistance of Occupy Wall Street, they’re moving into a new home — one of the thousands of vacant, foreclosed properties in Brooklyn. The Occupy movement has brought its protest against income inequality and financial corruption full circle to where the financial crisis began — the housing market. Occupy Our Homes, a spin-off of the Occupy Wall Street movement, held actions across the country on Tuesday, where activists illegally moved homeless families into vacant, foreclosed housing. 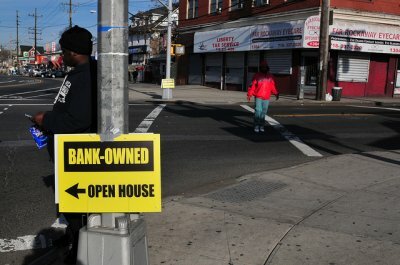 In New York, the group led over 500 people on a march through Brooklyn to identify vacant houses and apartment buildings, many of which are foreclosures that resulted from the 2008 subprime mortgage crisis. 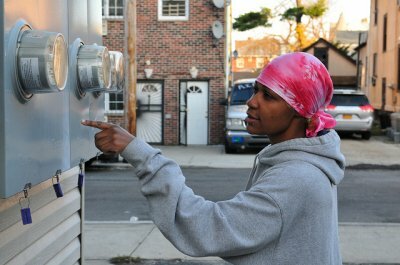 The day of action ended with activists illegally cleaning and renovating a foreclosed property in East New York. Later this week, Occupy Our Homes, along with housing activist organizations VOCAL New York, New York Communities for Change and Picture the Homeless, plan to move the homeless Glasgow family into the “occupied” house. Out of Foster Care And Into — What? In 2007, when the sub-prime mortgage crisis hit, 15,000 foreclosures were filed in New York City, reported Minyanville. Approximately 60 percent of those foreclosure filings were on two and four bedroom homes that were purchased by investors, who often rented them out to families. Many others were multi-unit apartment buildings. And unlike single family home foreclosures that one finds more often in suburban or rural areas, multi-unit building foreclosures force out all of the buildings’ residents in one swoop. As of April, 2011, there were over 30,000 pending foreclosure actions in New York City, and over 50 percent of all New York City foreclosure filings in 2010 were made on homes in just 11 neighborhoods, according to the Center for NYC Neighborhoods. There are currently 13,005 foreclosures in Brooklyn, according to RealtyTrac. As of 2009, more than 20 percent of properties facing foreclosure nationwide were rental properties, and renters made up 40 percent of families facing eviction, according to the National Low Income Housing Coalition.